A croque-monsieur, or grilled ham & cheese, when served with a fried egg or poached egg on top is known as a croque-madame. Many dictionaries attribute the name to the egg resembling an old fashioned woman’s hat! How fun is that? We were inspired to make this yummy sandwich by one of our favorite restaurants, Coquette Brasserie, and we decided to put a spin on it by using a croissant and Brie instead of the usual Gruyere cheese. 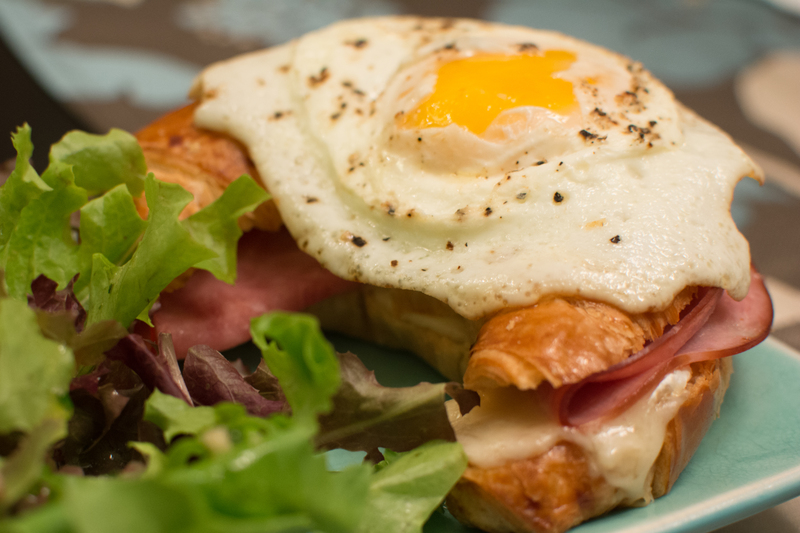 We just set a few slices of cherrywood ham and brie on the croissant and baked it for about ten minutes while frying up a sunny side up egg, which was still a bit runny. To accompany it, we enjoyed fresh salad greens from our garden with a homemade vinaigrette. Champagne white vinegar plus Penzey’s Sunny Paris seasoning made a perfect dressing! This was almost too easy for being so fancy. Mangez bien!